Edinburgh Capitals head coach Dmitri Khristich has ordered his team to cut out the mistakes and back-chat to officials beginning with their Challenge Cup clash against Dundee Stars. Caps, seeking their first win of the season, travel to Tayside on Saturday before getting their Elite League campaign underway on Sunday as Braehead Clan visit Murrayfield (face-off 6pm). 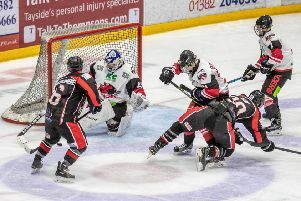 Defensive lapses cost Edinburgh in their opening weekend of competitive action, going down 5-2 at Fife Flyers and 6-5 at home against Belfast Giants. A a win on Saturday evening at Dundee is vital for Caps to realistically have any chance of progressing to the knock-out stages of the competition. New Capitals signing Marek Tvrdon marred his debut – in which he scored a goal in Fife – by receiving a match penalty for abuse of an official. Subsequently the Slovakian, who did not ice against Belfast as a result, will also miss both games this weekend as the Elite League’s Department of Player Safety handed him a further two-game suspension. Video evidence showed the player colliding with a linesman when skating back to argue an offside call. Meanwhile, last Sunday, Edinburgh’s experienced centre Alexander Islamov received a ten-minute misconduct penalty during Edinburgh’s attempted third-period fightback against Belfast. Khristich fully expects his side’s indiscipline to be nipped in the bud and said: “That has to be gone right away. Guys who don’t speak good English should not be going up to the referees – it just shouldn’t be happening in any games. “Talking to the referees like that, we shouldn’t be doing it, but, in my opinion, with Marek it’s way too harsh on him. Edinburgh will yet again be without last season’s top points scorer, Pavel Vorobyev. The player has, however, been granted a work visa and will fly to the Capital tomorrow. Canadian pre-season trialist Dillon Lawrence, who holds a British passport but will count as an import under Elite League rules, has agreed a deal with the club and, after missing last weekend’s games, is expected to ice on Saturday. Capitals are also still in the market for a defenceman and co-owner Scott Neil said: “Dillon arrived back in Edinburgh on Thursday. He will be part of the squad and will be utilised whenever Dmitri sees fit. “It’s important to have as many players available to play. We have a long season ahead of us and bringing in someone like Dillon perhaps means a guy won’t have to play with a niggling injury and keeps everyone that little bit fresher. “We’re looking for a defenceman as we speak. We’re trying to get the right guy in who will do the job that’s required, so we have to be a little bit selective on who we bring in. “There’s still a lot of players looking for a move. Training camps in North America are coming to an end, and there’s still options both in Europe and Russia.